Star Wars: The Clone Wars has been moved to the voting phase at SMGO.tv. SMGO.tv is a crowd sourcing website where fans can interact with the major studios and try to save their favorite shows. It's time for The Clone Wars community to mobilize and get 10,000 votes at SMGO. 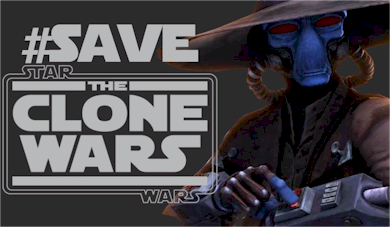 Once the goal is reached, SMGO will take our requests to Disney/LucasFilm and present Star Wars: The Clone Wars as a viable crowdfunding opportunity, and if they are granted permission, they will move The Clone Wars to the funding phase.